Photo Studio POS Software is an one stop solution for billing, customer management, loyalty and accounting needs for Photographers & Studio. Photographers work is more creative and innovate. They just always think to bring amazing output. Usually they feel billing, accounting, taxation, and other business-related operations as a burden and want someone to take care of. 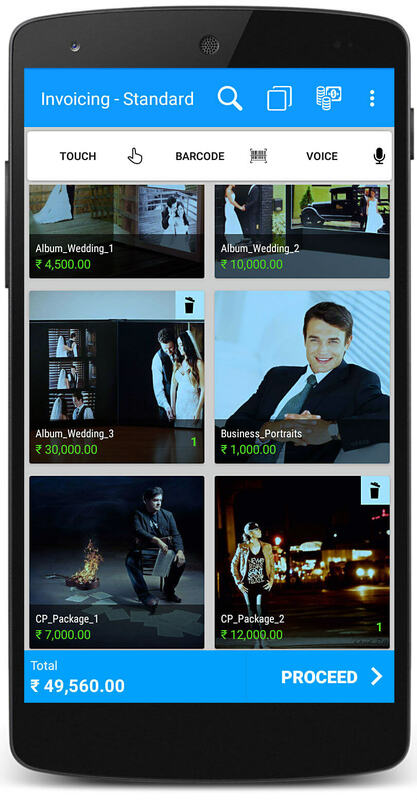 Just billing photo studio software makes all the works in clicks. This will reduce a lot of time taking tasks and employees to work. You don’t need to worry about accounting, taxation rules and regulations. You just bill, remaining things will take care automatically according to norms. Software made everything simple and quick to use. All you need to do is choose the service from the products list, enter customers details and amount, choose the payment option and then generate the invoice. Usually, photographers get booked in advance and paid with some fee. With just billing software, you can note the details of an event and advance amount. You can keep reminder and software can notify you the due date for the remaining amount. You can know what services people are taking from you by sales report. It can show the services which are having high demand near you. There is no restriction on pricing or standardization. You can change the pricing of your products or services according to demand, offers etc. Even you can keep multiple pricing of each product and select according to your requirement. If a customer booked you for some service and later want to add on another service, you can customize the service order at anytime and price accordingly. You can also create combo services for the people who are required. Always increase the business by knowing what your customers want. Just billing allows you to take customers feedbacks, suggestions and can structure your business by taking those into consideration. Checks the business reports and analytics, which shows how business is positioned and act correspondingly. Photographers work is not in the store or one place work. They always travel to different places with respective of work and internet may not be available all time. As just billing built in a way that works in offline too and can install in mobile. So, you can generate sales bill very easily. Photography is a profession when someone likes the service they always come whenever required. In our software, you can create loyalty programs to such customers by giving discounts. It makes them feel special and recommend you to others. Download and follow simple steps to setup Just Billing Photo Studio POS.